The Blackberry Vintage Range by Kennedy of Ardara is inspired by our reconnecting with a blackberry stitch cardigan designed by former director Margaret Kennedy in the c.1950’s. In 2015 Margaret’s grand-daughter Emma unexpectedly found the cardigan for sale online by a vintage store in Oregon, USA. 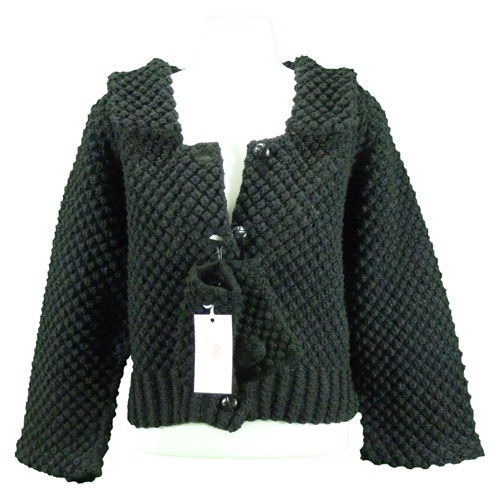 The cardigan was bought back and our local Donegal knitters commenced recreating this special garment, along with blackberry stitch accessories. The Blackberry Vintage cardigans have been produced in both Aran and Extra Fine Merino Wool in a variety of colours. The accessories have been produced in Extra Fine Merino Wool. The blackberry stitch is significant as it can only be made by hand. Fingerless Gloves in matching color are included with the Jacket, because it is the accessory that makes the look!